« Budapest Classic Film Marathon – Reversions – 2018. Italian documentary film biopic, documentary, screening: 90 minutes. The art educational movies are now 4 years of the series arriving to Uránia Movie Theater at Budapest. After huge success in terms of audiences and critics of “The Vatican Museums” and “Florence and the Uffizi Gallery”, and after the release of “Raphael – The Lord of the Arts”, here comes a new documentary … a retelling of the life of the celebrated 17th century painter through his brilliant, nearly blasphemous paintings and his flirtations with the underworld, dedicated to an Italian Master: Caravaggio – Soul and blood. 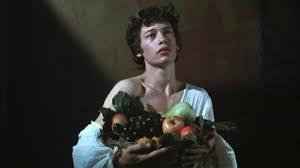 The film by the creators of the „Painter Lords” new film, which is again a prominent Italian master Caravaggio shows the time path of the working class and through personal struggles. The narrative unfolds on two levels …The artistic digression, in which the commentary of the main artworks will be entrusted to an illustrious art historian from the first painting: Bacchus and Boy with a Basket of Fruit. Through the roman period artworks: cardsharper, Judith Beheading Holofernes to the last works as David with the Head of Goliath. “Photographic” scenes that, accompanied by the voice of Caravaggio himself, evokes an object or a situation symbolizing his life and his works. A basket of fruit, a musical instrument, a sword, a great of a cell etc. These emotional and evocative moments – thanks to the use of light and cinematic techniques such time-lapse and slow motion – help the viewer to go deep inside the mind and soul of Caravaggio, empathizing with his impulses and fears. The Artistic Film productions are brought by the Pannonia-Entertainment Ltd.